The Premium Range of cookers is defined by its double top and bottom grill making baking, grilling and roasting easier than ever. Coupled with strong pot support to minimise spilling, cooking will be a truly pleasant experience. Double Enamel Coated Strong Pot Support.The pot support on the Premium 3 Gas + 1 Electric cooker is double enamel coated to give you the assurance of stability as you cook and help you minimise spills and messes. Double Enamel Coated Burner Caps The burner caps on the Premium 3 Gas + 1 Electric cooker are double enamel coated to protect your cooker against rust and extend its functional life..
Top and Bottom Grill The Premium 3 Gas + 1 Electric cooker comes with a top and bottom grill to make sure that your food is thoroughly cooked quickly and effectively. 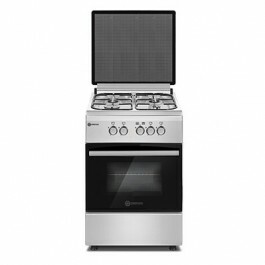 Superior Stainless Steel finish Stainless steel is resistant to corrosion, heat and chemical damage and the Premium 3 Gas + 1 Electric cooker comes with a sleek stainless steel finish to give your kitchen a beautiful yet durable look.